Well, that took a long time. Brighton band The Maccabees first emerged in 2007 on the strength of the single First Love. Their debut record Colour It In was actually pretty good but it seemed to me that the Maccabees was lost in the shuffle among the many, many “The _____” bands coming from England. It’s kind of weird how in the early 90’s you had a bunch of bands with a one word band name (Pulp, Suede, Blur, Oasis, Ride to name a few) and then in the 2000’s bands all decided to add the word “The” to the front (The Libertines, The Cribs, The Courteeners, The Pigeon Detectives, The View..). What’s up with that? While the Maccabees earlier material did sound like the typical English guitar rock band you had come to expect from anyone coming from overseas in the 2000s, to me, there was always a bit more there. The way Orlando Weeks sang his vocals, some of the arrangements, the kinda cool album covers – you knew they had a bit more art rock in them. Maybe it’s because they are from Brighton, home of British Sea Power, one of my favorite bands and also a band that is entirely in a world of their own. Given to the Wild was the Maccabee’s third record and one that starts to realize the Maccabees are capable of. Atmospheric and full of big ideas, it’s a more concentrated and consistent effort then previous records and it also netted the band a nomination for the Mercury Prize. Maybe it was on the heels of this success that the band decided to venture to Toronto for the first time. It’s quite rare for upstart UK bands to remain in the Old World these days, so it was a bit refreshing to see a band from England wait a few years before descending these shores. A mostly packed Mod Club crowd met the band with an enthusiastic response. The Maccabees played a 70 minute set that touched on all three albums, of which the older material seemed to strike more of a cord with the crowd. Orlando Weeks has one of the more unique voices I have heard in a while, and I can’t quite describe it, only when you take a look at the guy singing it, you are completely surprised that’s his voice. The White brothers, who are the guitarists of the band played the show with the typical British swagger you only seem to see from bands from England. 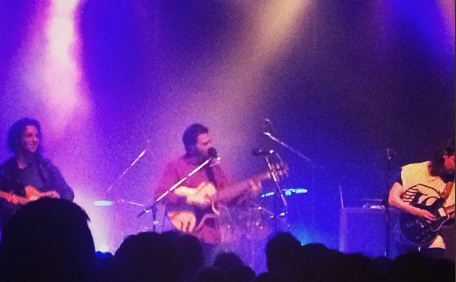 The set closed with the one two punch of Heave and Pelican, two strong tracks from Given To the Wild, perhaps given fans of their older work something to think about as they left the Mod Club.